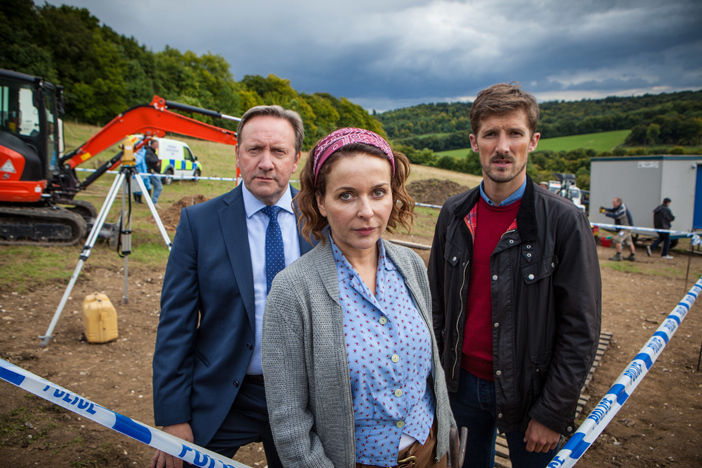 Julia Sawalha admits she has always wanted to be in an episode of Midsomer Murders. "I was just thrilled when they asked me. I've never worked on a show that runs like clockwork like this, it's extraordinary. Although you take your job very seriously, there's time for lots of laughs." Explaining the plotline she says: "This episode is based on the story of Cicely Milson, a woman who was tortured and made a saint by the local church. The church has housed her bones for many years and they have a 'Cicely Day' where they celebrate her as a saint. However, the brother of the local vicar is a historian and he discovers that those possibly weren't her bones&ldots;"
So how does her character, Penny Henderson, fit in? "She's quite high up in the ranks of archaeology but not to the point where she gets all of the glory for having found something. I think she's put up with that for a long time. She's very studious and did her thesis on this particular sainted woman so she was really intrigued by all of the research this brilliant local historian had done. So she's the one responsible for bringing the dig to Midsomer Cicely." As expected, there were some wonderful fellow guest stars, one of whom Julia had previously worked with. "Ruth Sheen. I absolutely think she is one of our greatest actresses. I'm totally star struck every time I see her and I couldn't believe she was on it. I was really upset actually because I didn't get to do any scenes with her." A self confessed Midsomer fan Julia says: "I always think I know who the murderer is but I have never once got it right. I think that's extraordinary to keep that formula going for 18 series and as a viewer, not crack how they're doing it. It just doesn't become predictable. "It's very well directed, acted and edited and I think it's a secure crime drama to watch, you can watch it with family and it's not disturbing. I just think it's a fabulous series. Long may it run!" Another ensemble piece Julia will be gracing our screens in the upcoming Ab Fab movie. She divulges: "There aren't massive changes; we're all highly dysfunctional characters that's really important. Jennifer has kept it very authentic and much time has passed so there's lots of material for her to get her teeth into. Lots of lovely guest roles but I can't tell you who!"